When you live in a smaller space, using every square inch to its maximum potential is important. 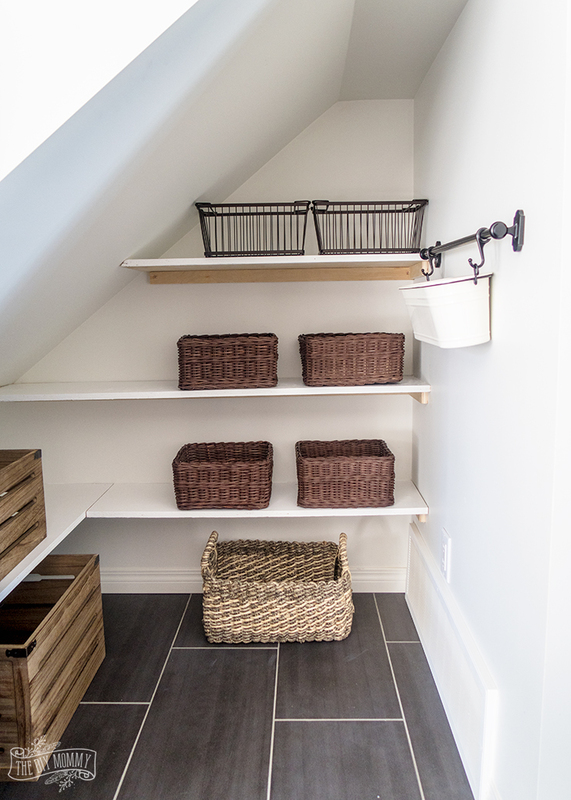 Lots of storage is a must, but concealing it is also important so that you can keep your home feeling tidy and uncluttered. 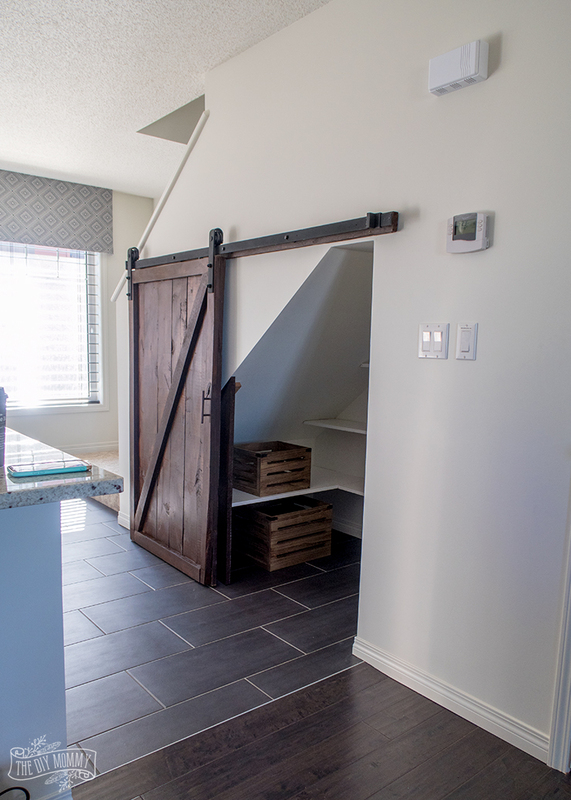 I had the privilege to work with Brookfield Residential in their beautiful Michelangelo town home and make this beautiful and practical under stairs pantry with a DIY sliding barn door. 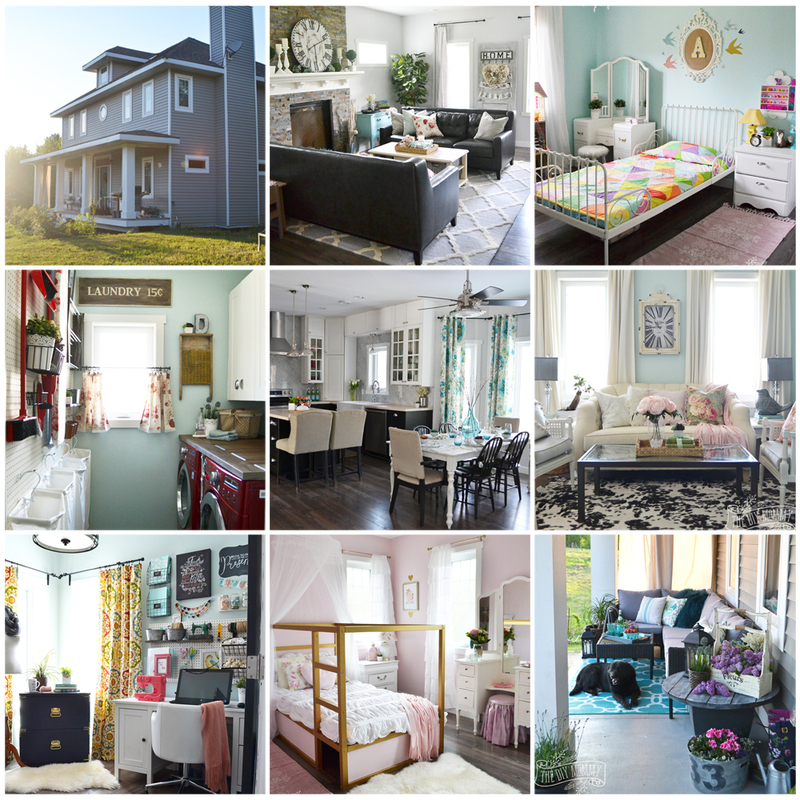 This home is 1,248 square feet and it features a lovely open main floor plan. 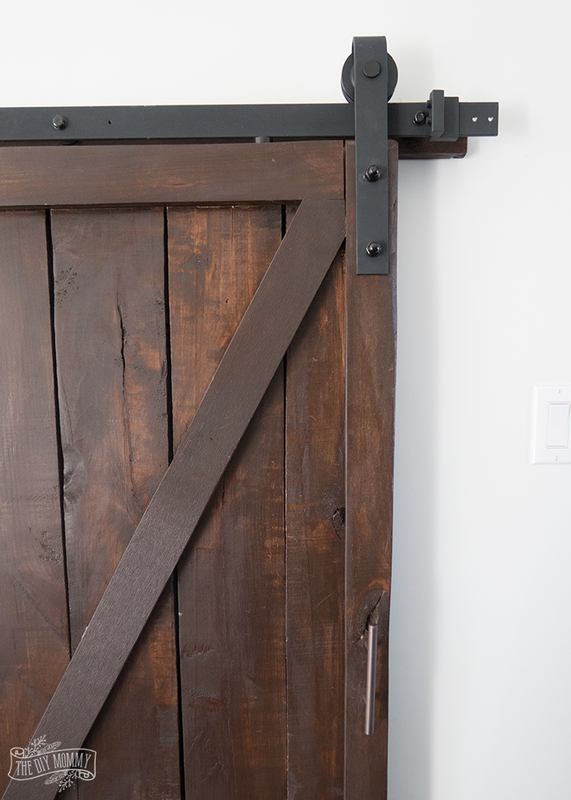 It’s already decorated in a really beautiful modern rustic style, so as soon as I saw it I knew a barn door would fit right in! 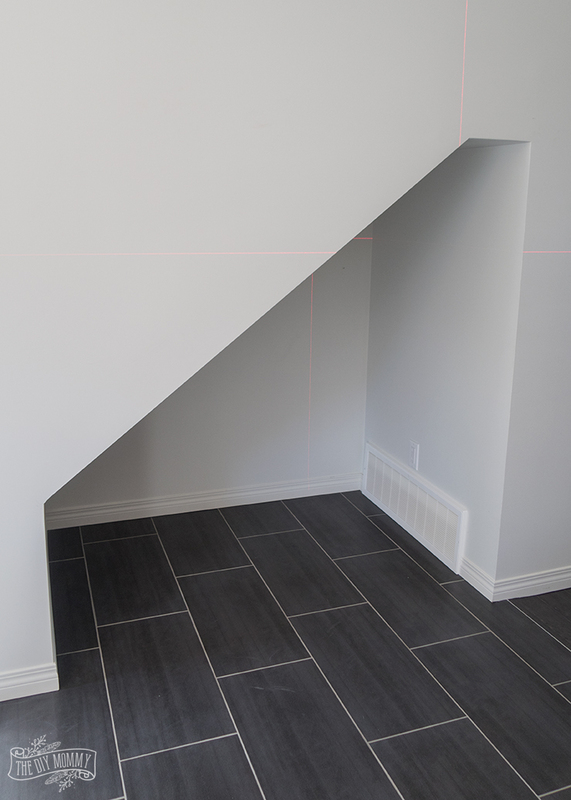 To showcase the functionality of the Michelangelo floor plan and give visitors and homeowners an idea on what they could do in their Brookfield Townhome, I decided to build a DIY under-stairs pantry with a sliding door here. It gives this home more storage space, plus it fits right in with the modern rustic style of this home. My ultra-handy husband helped me do some of the heavy table saw cutting for this project, and I think we made a great team! We did some of the work on site, and then some back at home in our shop. 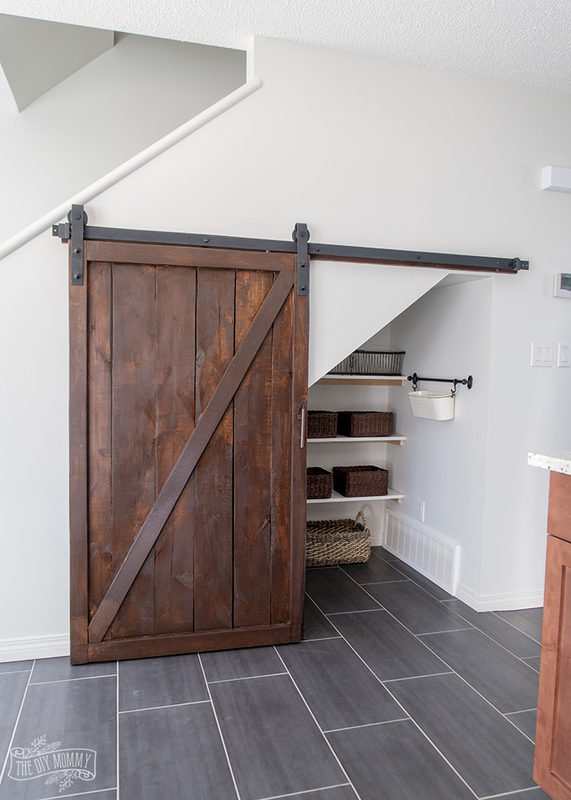 First, we decided that the barn door would need to slide to the left so that it wouldn’t cover the light switches and thermostat to the right of the under stairs nook. That’s when we decided that the shorter portion of the nook would need to be covered when the barn door was closed. 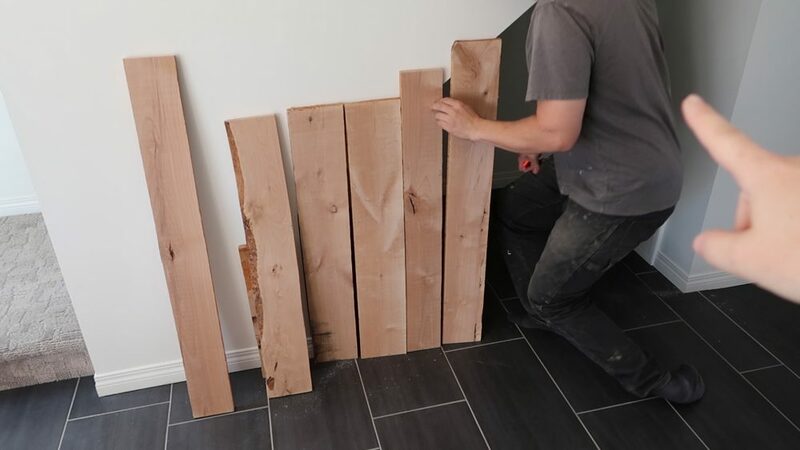 We purchased some inexpensive hardwood from a lumber store, and then measured and cut some pieces to fit the small side of the nook and to make a custom barn door. 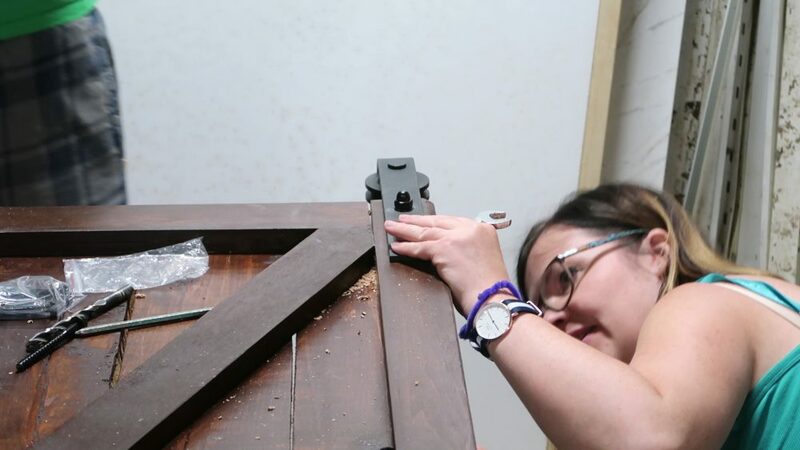 To build the door, we laid the cut pieces side-by-side, and then secured them with some thinner pieces of wood around the perimeter of the door, and one diagonally across the door. These pieces were secured with construction glue and nails. 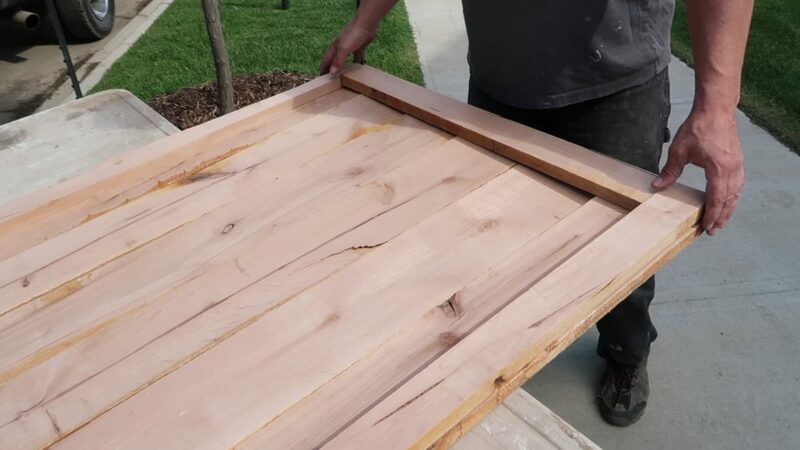 In retrospect, I wish I had sanded and stained all of the wood after it was cut and before it was nailed in place, but I stained the door and the other wood pieces after they were assembled. It was a little tricky to get into all of the nooks and crannies, but I did it! 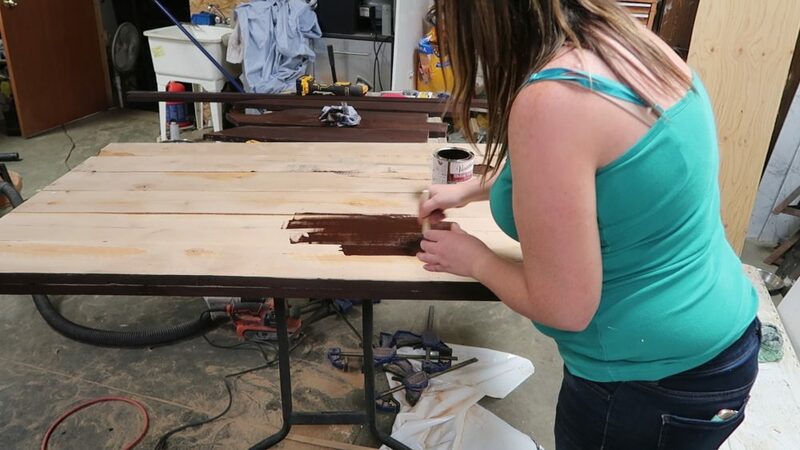 I used a dark walnut stain to match the rustic look of the rest of the home. After the barn door and the other wood pieces were stained and dry, I sealed everything with a coat of satin finish poly sealer. 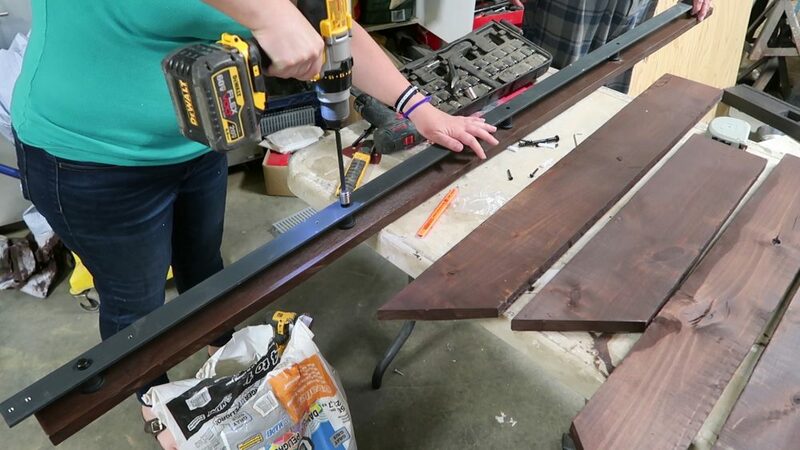 We purchased some barn door hardware at our local home improvement store, and since the holes on the rail didn’t line up to any studs above the nook, we screwed the railing to a scrap piece of wood, and then screwed that wood into the studs on the wall. We also installed the rollers to the door and added a simple cupboard pull to slide the door back and forth. Next, we nailed some backing boards onto the inside of the short end of the nook and got to work on the interior shelving. To make the shelves, we cut some 1/2 plywood to the sizes that we wanted. I planned on three 10″ deep shelves for the back and one 20″ for the left hand side of the nook. We also cut 2″ wide strips of plywood to hold the shelves up. Using a level and a straight edge, we marked where the shelves would go, and carefully screwed the shelf bases to the studs in the wall. Next, we installed the shelves on top of the bases with wood screws. I painted the tops of the shelves white to blend in with the colours of the home. 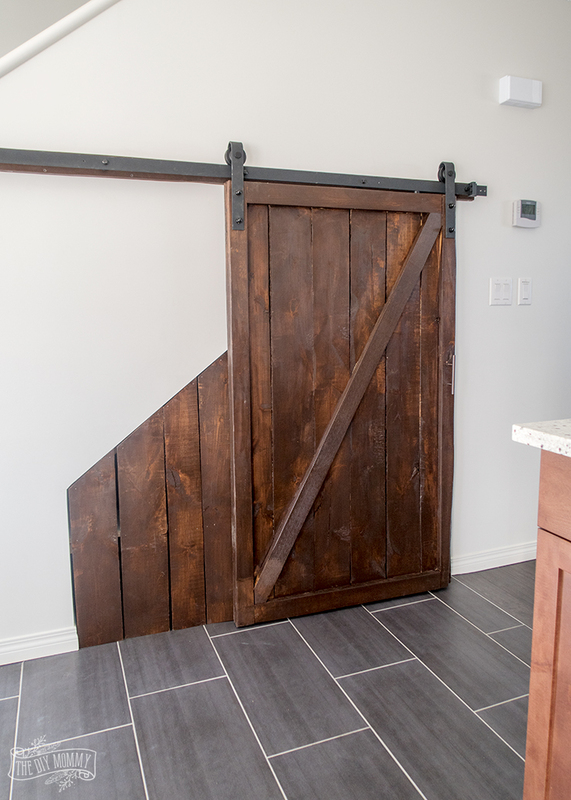 Once you have the hardware installed, hanging a barn door is quite simply – you just place its rollers on the rail! I also installed some stoppers on each end of the barn door rail. 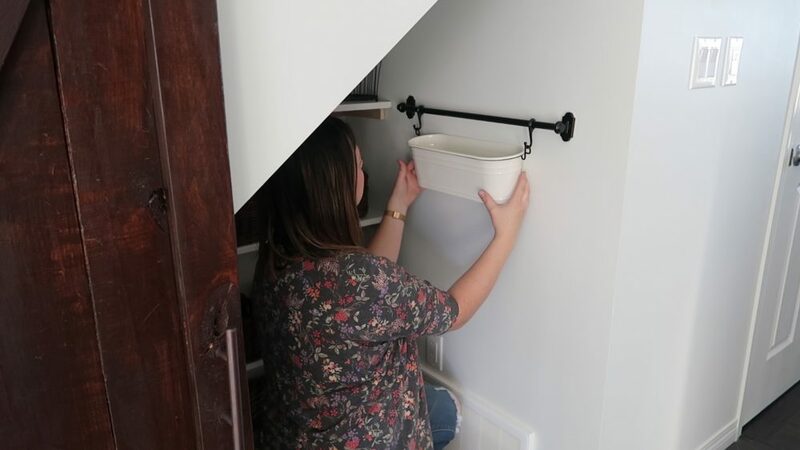 For a finishing touch, I lined the pantry with baskets and hung a little rod with a basket on one side of the nook for even more storage. The under stairs pantry with a custom DIY barn door is complete! I’m so happy with how this turned out, and if I lived here I’m sure I’d love looking at and using this little space. 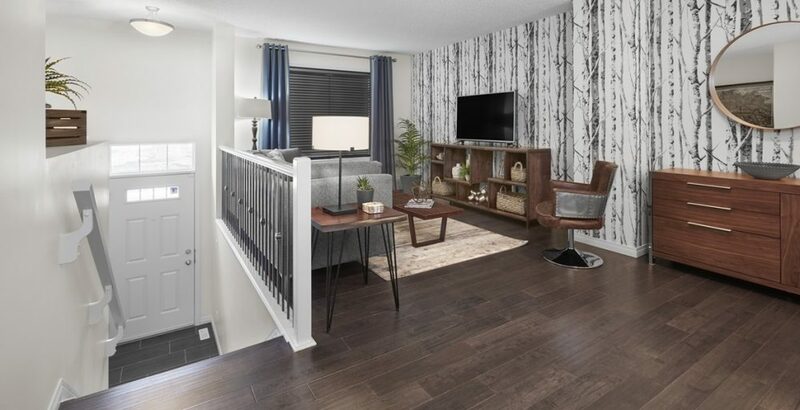 If you want to see this DIY in person and check out this beautiful showhome, it’s at the Grove on 25th project in the southwest community of The Orchards in Edmonton. 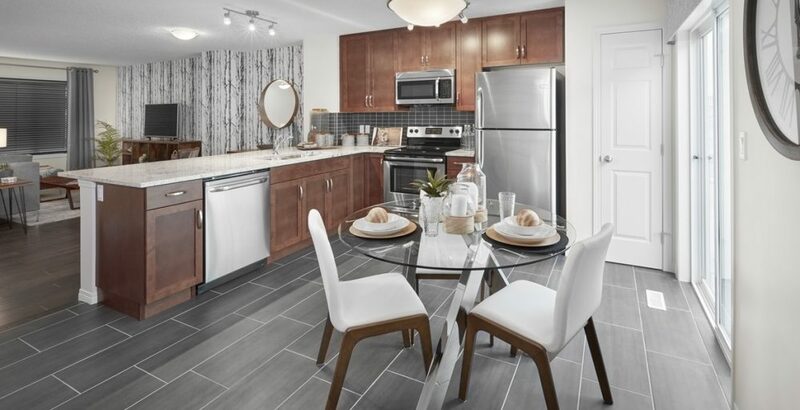 You can also read more about this Brookfield Residential show home right here. 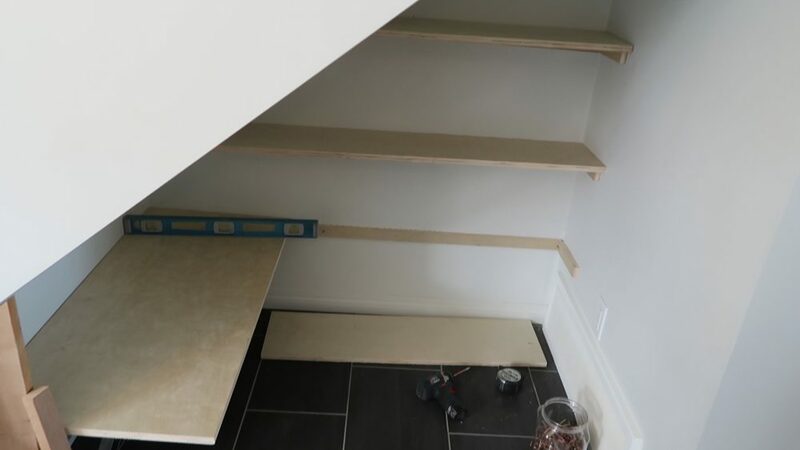 What would YOU store in this under stairs pantry? Disclaimer: This post is sponsored by Brookfield Residential. As always, all of the opinions here are my own. 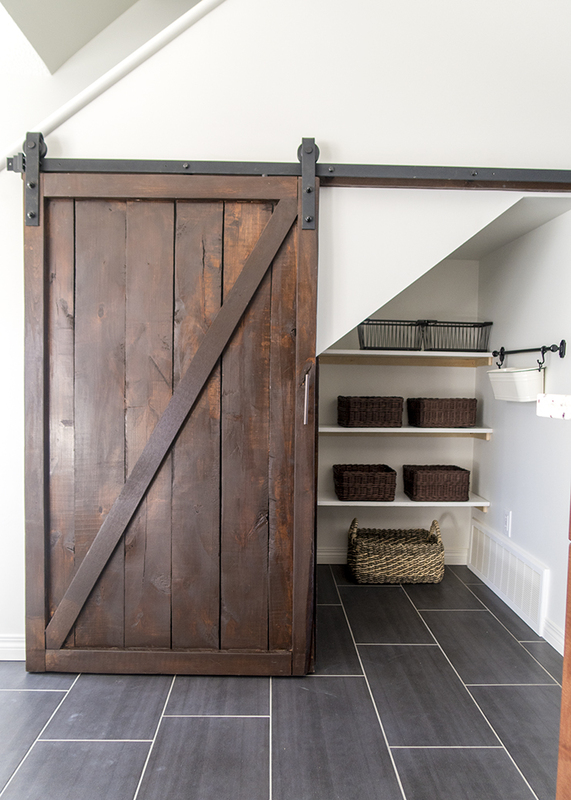 What a fantastic way to make use of wasted space and I love the barn door! 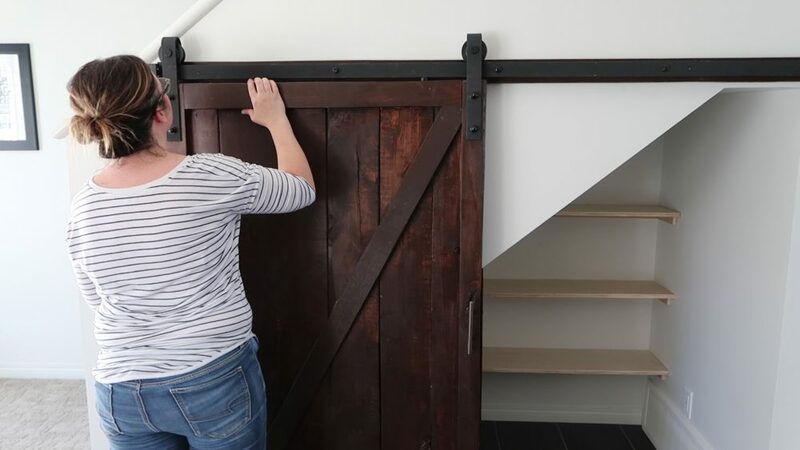 That’s an awesome idea, you’ve taken what many people would leave as a dark and messy hole and turned it into an awesome feature, I love the sliding barn door! Can I ask how much this project set you back? and were there any tricky bits to look out for? It looks so beautiful. I also have a boring empty place in my house beneath the stair. Now I’m also planning to make it. Well, frankly I can’t make this. 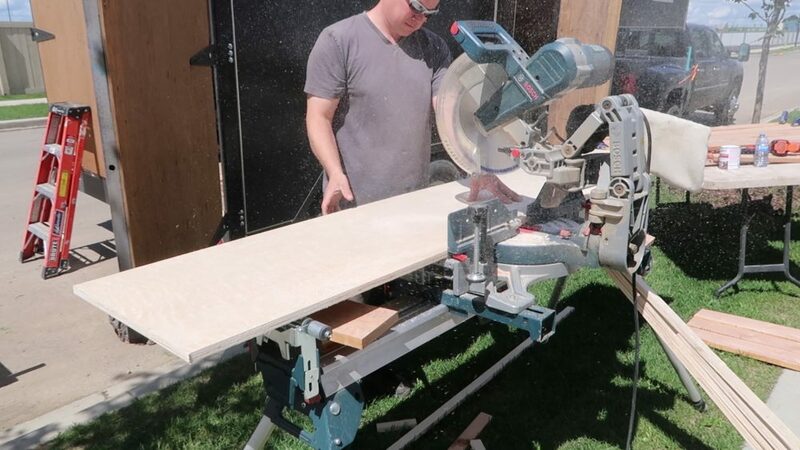 So, bookmarked this article and show it to my carpenter and get it made accordingly. Great job! It looks beautiful.. 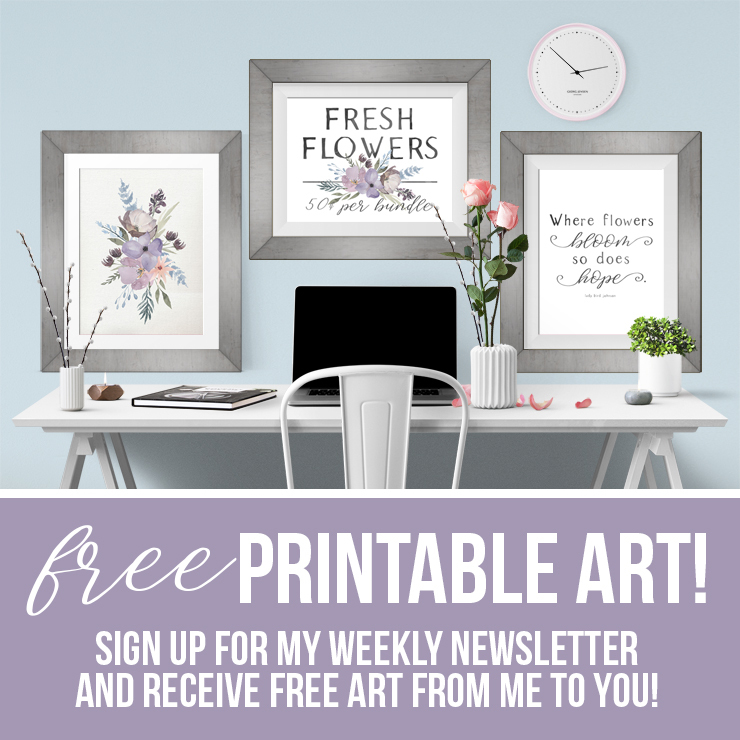 This is very informative and useful post for home makers. Thank you for sharing your work with us. Wow Christina. Thanks for this awesome post. 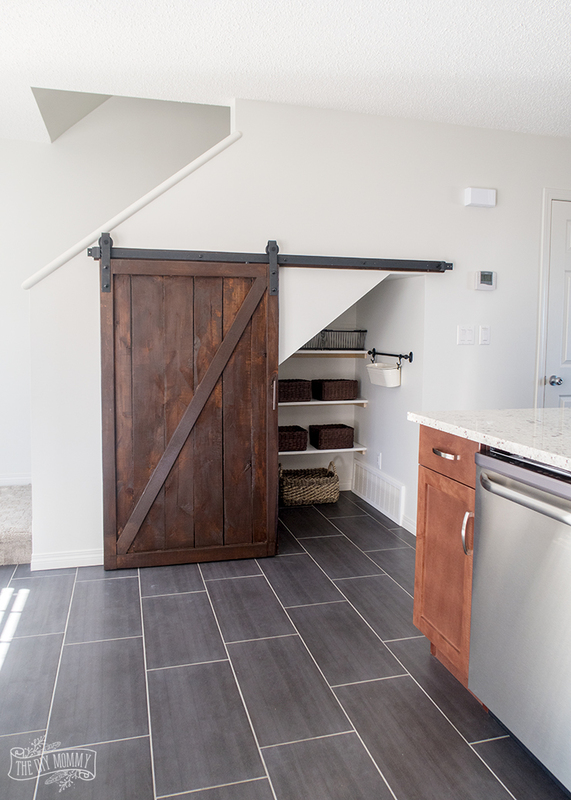 It’s such a great use of the space and the sliding barn door is so creative. Did you get this done in one day? I really like and appreciate that you take the time to share it all with us! I’ve learned so much from you. now i think that to build a colorful under-stairs pantry with a sliding door here. 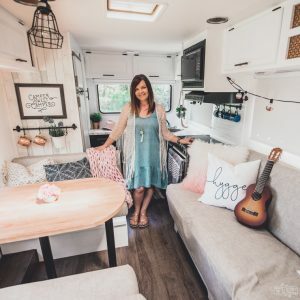 It gives this home more storage space, plus it fits right in with the modern rustic style of this home. I love this idea, we have a similar space in our home and my wife hates it, I think I’ll surprise her by doing something very similar over the next few days before she comes home. 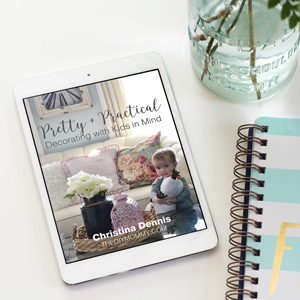 I love how it transformed that space of yours and how simple it was to do. I think that to build a colorful under-stairs pantry with a sliding door here. It gives this home more storage space, plus it fits right in with the modern rustic style of this home.